BM Catalysts is Europe’s largest independent manufacturer of aftermarket Catalytic Converters, Diesel Particulate Filters and Front Pipes. Starting life as a fast-fit centre in 1966, the Company has since blossomed into a world-renowned leading brand for emissions control in the automotive aftermarket industry. 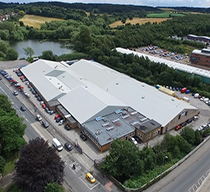 Its two hi-tech facilities in Nottinghamshire bring innovative product development and precision engineering to the sector whilst currently exporting to over 35 countries worldwide.